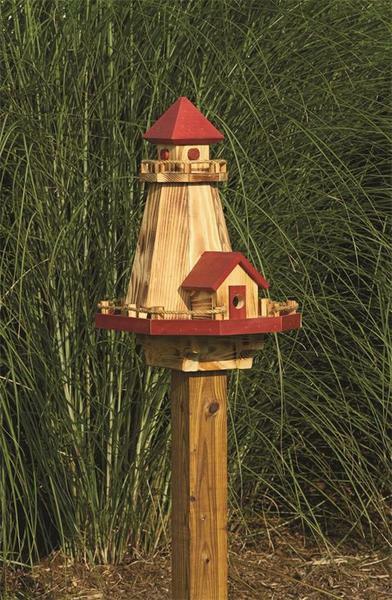 Bring the best of land, sea, and air to your garden with this beautifully handcrafted two-in-one lighthouse bird house and feeder. With stunning details such as twine rope fencing, gabled roofs, and textured surfaces, this wonderful piece is the ideal addition to any nautical or traditional outdoor space. Its solid wood construction promises years and years of enjoyment for both you and your feathered friends. Simply open the roof to fill the hidden seed hopper within, and then sit back and watch as birds flock to the lighthouse to enjoy their favorite snack. The added bird house invites guests to make your garden their permanent home! If you've any questions about this delightful piece, please give us a call or email - we could talk about this beautiful lighthouse all day. I just received my order and absolutely love both of my birdhouses!!! What quality work!!! As Arnold Schwarzenegger says . . . "I'll be back!!"